The quintessential covered bridge, Goodpasture Bridge is Oregon&apos;s most frequently photographed covered bridge - and it&apos;s easy to see why. Excellent vantage points along Hwy 126 showcase the bridge&apos;s elegant 165 foot (50 m) span across the scenic McKenzie River. The bridge itself is well crafted with attention to architectural details and classic style. 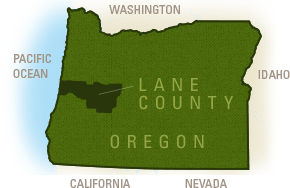 It is also the second longest covered bridge in Oregon (the first is Office Bridge in Westfir). 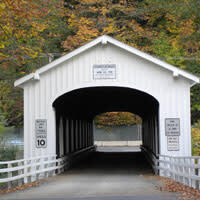 Goodpasture Covered Bridge was built in 1938 for $13,154. It was named for Benjamin Franklin Goodpasture, a pioneer farmer in the vicinity. In 1987, the bridge was failing under the heavy traffic load. 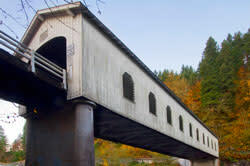 But instead of bypassing the historic bridge with a new concrete and steel bridge - like had been done at so many other covered bridge crossings - the county invested $750,000 to renovate the original structure. Then in 2012, an additonal $2 million overhaul included a new roof and beam reinforcements. Structural improvements have made it traffic-worthy enough for both logging trucks and the daily commute of 300 area residents that rely on this crossing. The bridge features false end beams, semi-elliptical portals and ten Gothic-style louvered windows on each side. Modern day enhancements include a customizable LED lighting system, which baths the bridge in white light at night. During the holiday season it is festively lit in color and decked with Christmas trimmings. In 2005, Goodpasture Bridge was the first featured covered bridge in a series of commemorative coins released to raise maintenance funds.